It's nearly December, and you know what I've realised? December screws with EVERYONE'S MINDS. The world goes weird. Clocks start moving in some kind of physically-impossible, frenzied mania. Each hour passes twice as fast as it ought to. And people (me, usually) suddenly start wanting to catch up over champagne lunches. Every night feels like it ought to end with soft cheese and wine, or a glass of baileys in a bath full of pumpkin-pie scented bubbles. It all sounds delicious and glorious really, the only problem is there's just no bloody time. I have bought no Christmas presents. I have written no cards. I have cooked no gingerbread. I haven't watched any Christmas movies and I haven't listened to a single carol to speak of. You know what I am? 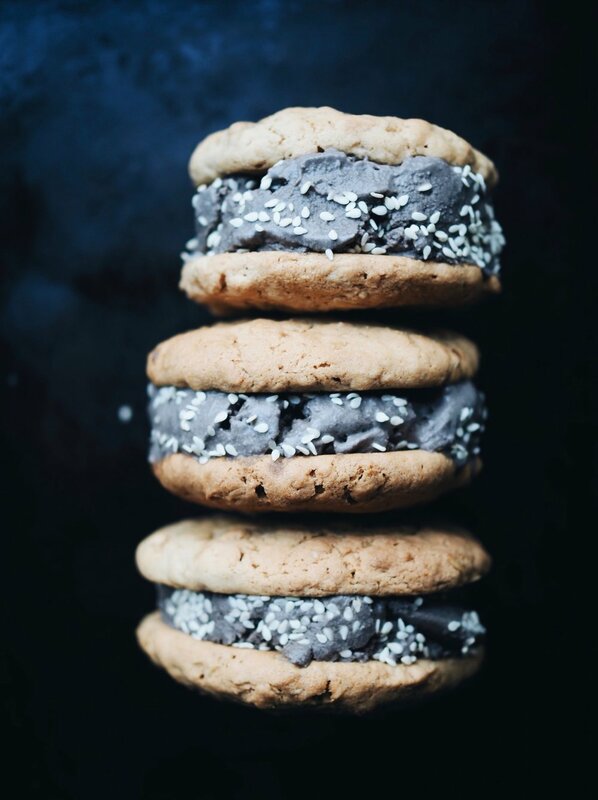 I am this Black Tahini Ice-cream Sandwich. Trapped between the UNRELENTING PRESSURE of two maple-flavoured vegan Anzac cookies, becoming ever so slightly untethered and INCREASINGLY MELTING AWAY. Please somebody, bake me the awesome retro gingerbread house from the 70s that I promised I'd make myself a month ago. Please buy my gifts and wrap them for me. Please write my thesis. Then put me on a nice cold tray and shovel me into the freezer with an icy beer while I re-combobulate myself. And when I come out give me a new dress, a tan, and a relatively more composed frame of mind in time for December 25th. Whisk together all ingredients for the ice-cream until thoroughly combined. Pour into an ice-cream maker and churn until thick and cold. Store in the freezer in a sealed contained until using. For the biscuits, put flour, oats, coconut, bicarb soda, almonds and salt in a big bowl. Mix well to combine. In a smaller bowl, mix the maple syrup and olive oil. Pour this into the big bowl and stir until well combined. If the mixture is still a bit dry add a few tablespoons of cold water until it sticks together and can be rolled into balls. Roll biscuit dough into balls, place on a baking tray lined with parchment paper, and press down to flatten slightly. Cook in a moderate (160˚C) oven for 15 minutes, or until they have started to brown. Take out and let cool on a rack before assembling into your ice-cream sandwiches. 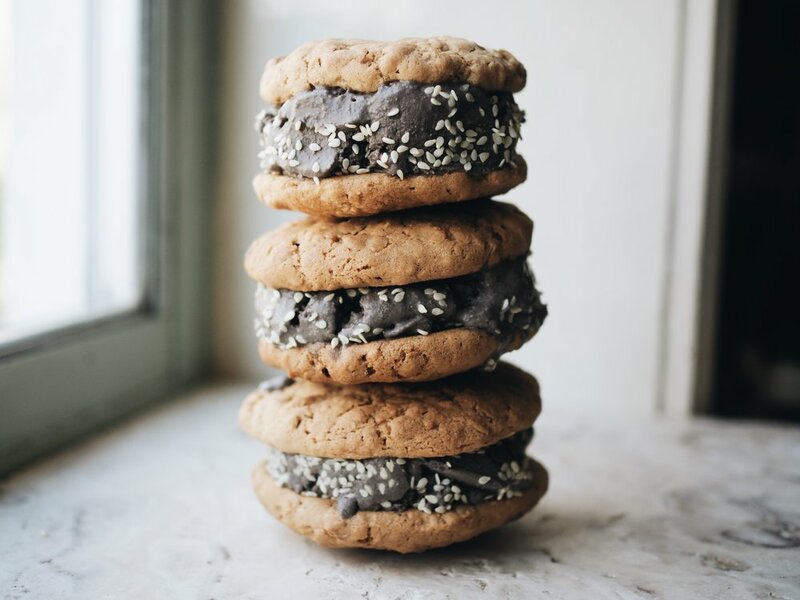 To assemble your ice cream sandwiches, take one biscuit and put a scoop of ice-cream on top, then place another biscuit on top. If you want to make them look fancy, sprinkle a few white sesame seeds around the edges of the ice cream. Serve and eat at once before they melt!